The Huawei P10 Lite smartphone delivers consistent performance for every day. Flaunting a graphite black finish, this smartphone exudes a sophisticated look. 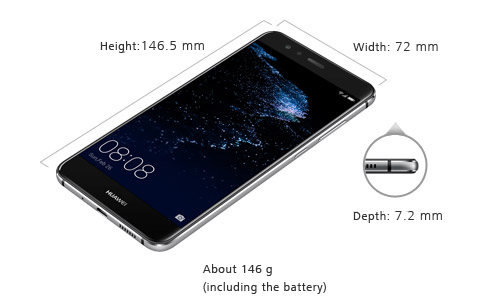 The large 5.2 inch screen with 2K display renders ultra bright, vivid and sharp contents. This device has a fingerprint sensor that ensures safety of your phone, at your fingerprints. Enjoy smooth and fast paced internet connection as this smartphone supports 4G LTE network. This device is powered by a 3200mAh battery that keeps you unplugged for long hours, which makes it an ideal companion when traveling long distances. This Huawei smartphone runs on Android 7 Nougat operating system that gives you an excellent user interface with amazing features. This smartphone incorporates a Kirin 960 Octa Core processor that runs all your applications at lightning fast speeds. This device delivers extremely efficient multitasking experience, thanks to the 3GB RAM module. Load this mobile with all your favorite movies, photos, songs, games, and much more, thanks to its massive 32GB internal storage. Flaunt your photography skills with this P10 Lite smartphone having great cameras that deliver crystal clear images in any light condition. Furthermore, the 20MP plus 12MP rear and 8MP front cameras let you capture all the memorable moments of your life in a jiffy. This phone is set to catch attention with its attractive body and flagship performance. This Huawei P10 Lite Dual SIM smartphone delivers an efficient performance with its ultra fast Kirin 960 processor. It has an Octa Core processor with four Cortex A73 clocked at 2.4GHz, and four Cortex A53 clocked at 1.8GHz, which delivers a superfast performance. The apps load faster than ever, thanks to the HUAWEI Ultra Memory technology that intelligently allocates, recycles and compresses the memory. This CPU is made pacier with a 3GB RAM module.When you want to open an app or run multiple tasks at once, they both collaborate to make the operations run smoothly. This phone has a neat and user friendly screen design as it is preinstalled with Android 7 OS, which helps you interact with the device in a fun and easy way. This Huawei P10 Lite Dual SIM smartphone flaunts a smooth, hyper diamond cut finishing. It has an ultra slim 7mm lightweight body with a sleek back cover, enhanced by evenly rounded curves. Also, the slick concave power button prevents accidental depressions and keeps the phone looking sharp. This phone has a large 5.2inch screen with a 2K display, which enhances brightness and makes the phone pleasurable to hold every time you pick it up. Convenience meets minimal, clean design as the fingerprint sensor is placed beneath the front screen glass, which makes navigation easier. Capture the world more clearly and vividly with the Huawei P10 Lite dual SIM smartphone. The Leica dual Camera 2.0 Pro Edition fitted in this mobile uses precise 3D facial detection, dynamic illumination, and natural portrait enhancements to produce stunning artistic portrait shots in Leica image style. Click stunning selfies as the Leica front camera captures 2x more light, rendering incredible self portraits, whether day or night. Additionally, the P10 smartphoneeven senses the presence of more people and automatically switches to wide angle shots for crisp group photos. Furthermore, the HUAWEI P10 Lite Leica Dual Camera carries two SUMMILUX H lenses with a larger aperture of f/1.8, which stabilizes the image and is excellent for 4K shooting and superior low light photography. The P10 Lite dual SIM smartphone uses USB 2.0 port to transfer data from the device to a PC quickly. Switch on the Bluetooth 4.2 connectivity when sharing files between mobiles and tablets for quick wireless data transfer. Furthermore, the WiFi 802.11ac/a/b/g/n gives you unmatched speeds for fast surfing, streaming, downloading, and sharing. Never miss connecting with your friends as this phone is powered by a massive 3200mAh battery, which keeps you going.